Not long ago I woke up on a Wednesday morning and had no idea what I'd be bringing for my lunch that day. 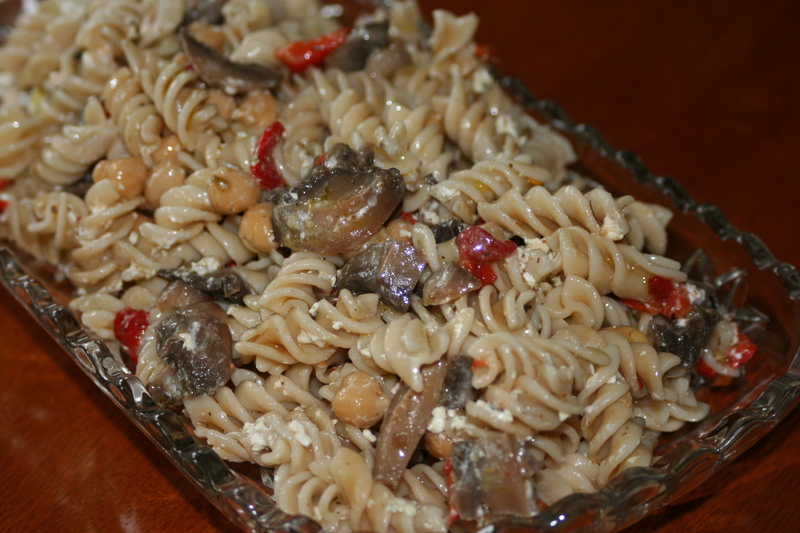 I picked a few ingredients from my pantry and voila, this pasta salad was born! I enjoyed my lunch and made another batch of this salad for the weekend. This "recipe" is not so much specific quantities, but rather the ingredients, so tailor the seasonings to your tastes and pantry supplies. Feel free to add chopped onions or tomatoes. Make sure to add plenty of olive oil. This is perfect for a summer picnic. To make this gluten-free, be sure to use brown rice pasta. Add all of the ingredients to a bowl and toss to combine. Cool for an hour or two to allow the flavors to meld. Taste and adjust seasonings as needed.